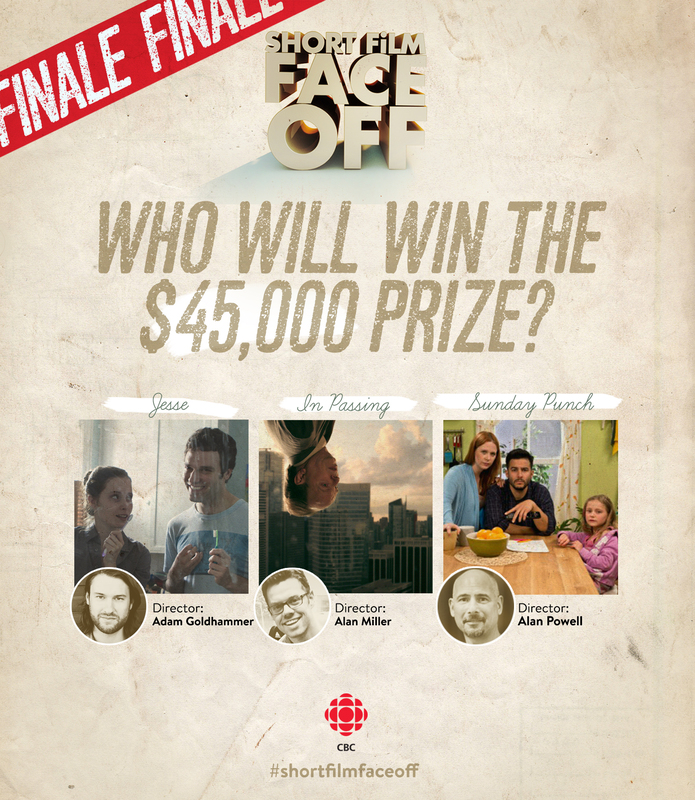 The final installment of this season’s Short Film Face Off on CBC Television was broadcast on October 4, in which the winner of a coveted $45,000 film production prize was announced at the end of the program. The prize was a combination of a cash award of $30,000 from Telefilm Canada called the Telefilm Canada Short Film Face Off Award, as well as a $15,000 equipment rental package from PS Production Services and SIM Digital. The viewing audience had the final say in which film would win by voting online or via telephone after the September 27th broadcast. We were re-introduced to the three film makers who were chosen as finalists by the studio audience and panelists throughout the series. They were Alan Powell (‘Sunday Punch’), Adam Goldhammer (‘Jesse’) and Alan Miller (‘In Passing’). All three finalists had one last chance at showing their films, and the panel offered some final parting thoughts about each film. Before the winner was announced, we were treated to a visit by Jasmine Oore, the Short Film Face Off champion in 2009. She gave us a sneak preview of her new film, ‘There’s Been A Terrible Mistake’ that she made with the prize money she won that year. The film was based on Oore’s personal experience regarding the aftermath of a car accident that she and her partner were involved in. Finally, and after much waiting, Francesca Accinelli, Director of National Promotion from Telefilm Canada, joined Steve Patterson with envelope in hand containing the prize cheque. Alan Miller’s ‘In Passing’ was announced by Steve as the 2014 Short Film Face Off winner. Congratulations, Alan. I had a great time watching Short Film Face Off this season. All of the featured film makers were talented, and their stories were unique and enlightening. I appreciated hearing commentary and analysis from Eli, Michelle, and Mohit about each film. These comments were helpful in teaching the audience about the technical aspects of film making. Steve’s humour kept everyone upbeat, and I liked how he kept the studio audience engaged by asking random members to give their own opinions. I’m looking forward to watching next year’s competition. A big round of applause goes to the staff and crew who made the show possible. I hope that a 30-minute short film program could be produced and broadcast on CBC that would feature interviews, sneak previews and ‘how to’ tips about Canadian short films. This could be one way to keep these films and the industry visible in the public eye before the next season of Short Film Face Off airs. Any thoughts?